In a rare case of having their cake and eating it too, scientists from the National Institute of Standards and Technology (NIST) and other institutions have developed* a toolset that allows them to explore the complex interior of tiny, multi-layered batteries they devised. It provides insight into the batteries' performance without destroying them—resulting in both a useful probe for scientists and a potential power source for micromachines. The microscopic lithium-ion batteries are created by taking a silicon wire a few micrometers long and covering it in successive layers of different materials. Instead of a cake, however, each finished battery looks more like a tiny tree. The analogy becomes obvious when you see the batteries attached by their roots to silicon wafers and clustered together by the million into "nanoforests," as the team dubs them. microelectromechanical machines – which have potentially revolutionary applications in many fields. With so many layers that can vary in thickness, morphology and other parameters, it's crucial to know the best way to build each layer to enhance the battery's performance, as the team found in previous research. ** But conventional transmission electron microscopy (TEM) couldn't provide all the details needed, so the team created a new technique that involved multimode scanning TEM (STEM) imaging. With STEM, electrons illuminate the battery, which scatters them at a wide range of angles. 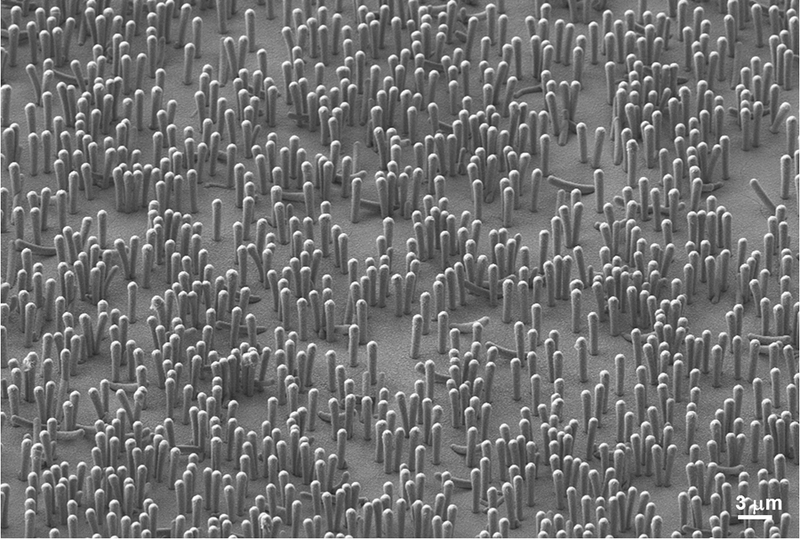 To see as much detail as possible, the team decided to use a set of electron detectors to collect electrons in a wide range of scattering angles, an arrangement that gave them plenty of structural information to assemble a clear picture of the battery's interior, down to the nanoscale level. 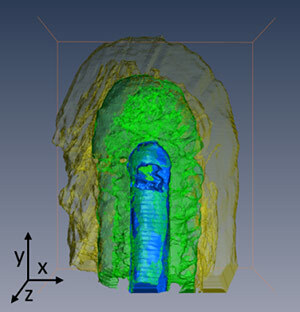 A colorized 3D side view of a battery showing the metallized silicon core and its outer layers. The promising toolset of electron microscopy techniques helped the researchers to home in on better ways to build the tiny batteries. "We had a lot of choices in what materials to deposit and in what thicknesses, and a lot of theories about what to do," team member Vladimir Oleshko says. "But now, as a result of our analyses, we have direct evidence of the best approach. "MEMS manufacturers could make use of the batteries themselves, a million of which can be fabricated on a square centimeter of a silicon wafer. But the same manufacturers also could benefit from the team's analytical toolset. Oleshko points out that the young, rapidly emerging field of additive manufacturing, which creates devices by building up component materials layer by layer, often needs to analyze its creations in a noninvasive way. For that job, the team's approach might take the cake. *V.P. Oleshko, T. Lam, D. Ruzmetov, P. Haney, H.J. Lezec, A.V. Davydov, S.Krylyuk, J.Cumings and A.A. Talin. Miniature all-solid-state heterostructure nanowire Li-ion batteries as a tool for engineering and structural diagnostics of nanoscale electrochemical processes. 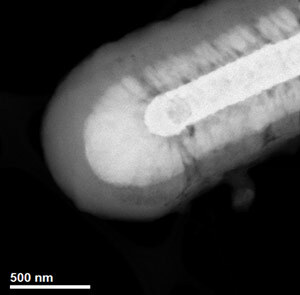 Nanoscale, DOI: 0.1039/c4nr01666a, Aug. 15, 2014.